"VAN CAMP". 2 7/8" high x 2" wide x 1/2" deep. Stamped steel case. Steel shackle. "VENUS". 2 1/8" high x 1 5/8" wide. Stamped steel case. Steel shackle. 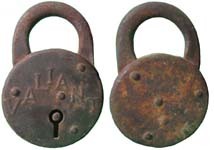 "CORBIN CABINET LOCK CO. NEW BRITAIN, CONN." is stamped on the reverse of the case. Mfg by: Corbin Cabinet Lock Co.
"VICI - Design 1". 2 1/2" high x 1 3/4" wide. Stamped steel case. Steel shackle. Mfg by: Miller Lock Co.
"VICI - Design 2". 2 1/2" high x 1 3/4" wide. Stamped steel case. Steel shackle. Mfg by: Miller Lock Co.
"VICTOR". 3 3/16" high x 2" wide. Stamped steel case. Steel shackle. Mfg by: Eagle Lock Co.
"VICTORY - Design 1". 3 1/8" high x 2 3/8" wide. Stamped steel case. Steel shackle. The reverse of the case is blank. Mfg by: E. T. Fraim Lock Co.
"VIGILANT". 2 1/4" high x 1 1/2" wide x 1/4" deep. Stamped steel case. Steel shackle. "Canadian Yale & Towne Limited - St. Catherines, Ont." is stamped on the reverse of the case. Mfg by: Yale & Towne Mfg. 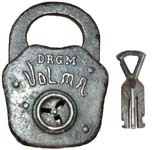 Co.
"VOLMA DRGM". 3 1/2" high x 2 1/2" wide. Key length: 1 3/4". Steel case. Steel shackle. Mfg by: German manufacturer. "VOLUNTEER". 1 13/16" wide. Steel case. Steel shackle. Mfg by: Yale & Towne Mfg. Co. US Patent #910967.